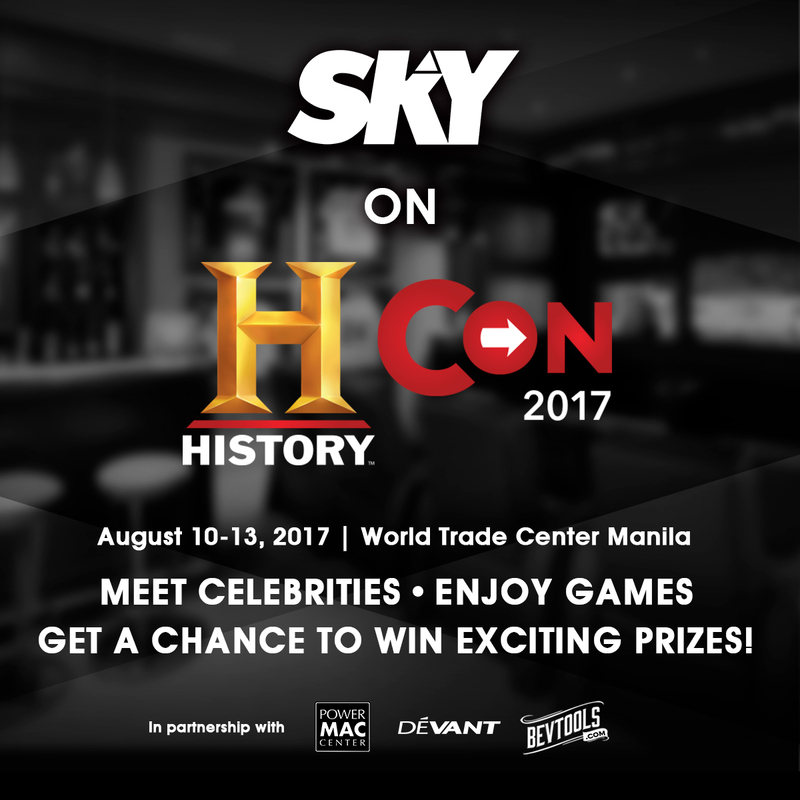 SKY, the country’s leading cable TV provider, jacks up the entertainment at the History Con 2017 happening at the World Trade Center from August 10 to 13 with its trademark experiential entertainment offerings. Guests can troop to the SKY Man Cave, an entertainment and play center, surfing hotspot, and a cocktails bar rolled into one. Learn how to make your favorite cocktail drinks in the bartending demos courtesy of BevTools, the complete store for your barware, beverage, and liquor needs, happening daily at 1 PM, 3 PM, 5 PM, and 7 PM. Join the foosball and basketball challenge for a chance to win a Man Cave showcase that will add to your home entertainment experience including a 50" SMART TV with Sound bar, a 21-inch iMac plus Bose Soundtouch 30 Wireless Sound System, a black leather La-Z-Boy premium recliner, an old fashioned cocktail kit, plus a free 6-month subscription to ONE SKY premium plan composed of Fiber-Powered Broadband, HD Cable TV and Mobile Internet Services. The raffle is made possible through DEVANT, Power Mac and BevTools. SKY will also bring 2015 Awit Awards best new female artist, Kiana Valenciano to grace the stage onSaturday, August 12 at 4 PM. Meanwhile, on August 13 actress and model Sarah Lahbati will visit the booth to meet and greet fans, and take pictures from 4 to 6 PM. Take time to enjoy SKY’s services where HISTORY can be enjoyed—SKYcable, SKYdirect, One SKY, SKYcable, and Sky on Demand. After taking Manila by storm in 2016, History Con 2017 flies in some of HISTORY’s most popular stars like Corey Harrison from “Pawn Stars,” ‘Horny’ Mike Henry from “Counting Cars,” and Jamie Dempsey from “Ride N’ Seek,” John Weisbarth and Zach Griffin (“Tiny House Nation”), and Adam Liaw (“Destination Flavor”). Geeks and fans will have a field day as special guests drop by to share their unique and HISTORY-worthy expertise like professional freestyle dunker Jordan Kilganon, Takeru Kobayashi who is a professional competitive eater, Filipino Historian Ambeth Ocampo, and Barry “Butch” E. Wilmore, a real-life astronaut with 178 days in space and 25 hours of spacewalk under his belt. “HISTORY CON 2017 takes conventions to the next level - it now caters to all members of the family. A day is not even enough to fully experience and be immersed in our global event. We are committed to bringing a BIGGER, BETTER, BOLDER HistoryCon to our Filipino fans,” said Jacque M. Ruby, Country Head, A&E Networks. With over 300 exhibitors this year, the convention has expanded to include the outside tent of the World Trade center. The tent will house the FYI Home and Living Fair. Get your tickets now at www.historyasia.com/historycon.